Have you been diagnosed with diabetes? A low carb diet like to ketogenic diet can be great for diabetics. Check out these low carb tips before getting started. According to an updated report that was released by the Centers for Disease Control and Prevention (CDC), 30.3 million (or 9.4%) of Americans have diabetes. In 2015 alone, there were an estimated 1.5 million new cases of diabetes among people ages 18 and older diagnosed. What’s scary is that one in four people diagnosed didn’t even know they had it. You’re probably familiar with the most common form of diabetes, which is type Type 2 Diabetes. People with this issue do not to properly produce insulin. There have been many diets presented to help people deal with the difficult disease. However, studies that were published by the National Institute Of Health as well as on Diabetesjourals.org show low-carb diets like the ketogenic diet to be more effective for people who are trying to achieve weight loss and also more effective at helping to maintaining blood sugar levels. It’s pretty simple why low carb diets work. The body converts carbs into glucose, which in turn will raise blood sugar levels. Refined carbohydrates, like those found in pasta or white bread, is processed by your body just like refined sugar is processed. This means it will convert into glucose in your body more quickly than unrefined carbs, like vegetables and whole grains, which actually slow down the glucose conversion process. It’s important to remember that if you eat a lot of carbohydrates, especially refined or simple carbs, it’s possible that your body might make more glucose than it needs. When that happens, the extra glucose is converted to fat and stored for later. The storing of this excess glucose as fat is very dangerous for people diabetes. Not only can it cause a blood-sugar spike, but when your body starts to convert glucose into fat, your blood sugar level can drop down much too quickly, causing an episode of hypoglycemia. It’s always important to talk to your doctor when starting any new diet. If you’re ready to start your low carb or keto diet and you have Type 2 Diabetes, read these 4 tips that will help you to maintain healthier blood sugar levels while following a ketogenic diet. The CDC says that most Americans eat approximately 50-60% of their calories in the form of carbohydrates. That means someone who eats a 2,000-calorie diet eats about 275 grams in carbohydrates each day. To start off, try to cut back to 30-40% of your calorie intake being carbs. So about instead of 275 grams, shoot for 125 grams if you eat a 2,000-calorie diet. This reduction can help to keep blood sugar levels lower. If you want to follow a ketogenic diet, which means no more than 20 carbs per day, keep reducing your intake slowly so your body can adjust. And be sure to talk to your doctor for advice. It’s really important that you keep from consuming any refined carbohydrates when you’re on a low-carb diet as they will cause the body to make glucose much more quickly than it can make insulin to keep up with the demand. As we said, the excess glucose will be converted to fat. Be sure to skip the pasta and choose spiralized veggies or spaghetti squash instead. Eat plenty of fiber-rich fruits and veggies, such as raspberries or leafy greens like kale and chard. If you’re going to eat grains, be sure they’re whole grains that contain important minerals like magnesium, selenium and potassium. Avoid refined sugar at all costs. Reach for a hand full of nuts instead of chocolate next time you feel a snack craving. We love lean meats since they have no carbs, like organic chicken and wild caught fish. Salmon is a very good choice since it contains high levels of good omega­ 3 fatty acids. Nuts are a great high protein snack, and they also contain healthy fats. You can also try lactose-free dairy and yogurt as good protein options. Beans are only permissible when you’re first lowering your carb intake – you won’t want to eat them on a true keto diet. While it’s not really a food recommendation, exercise is extraordinarily important if you want the diet to work optimally for you. Studies show people with sedentary lifestyles have more trouble with diabetes in addition to heart disease. Exercise also helps you to lose unwanted weight, alleviate anxious feelings and give your metabolism a speed boost. All of these things will help you to keep the extra weight off and keep your blood sugar levels nice and stable. In addition, exercise is a wonderful energy booster. Even making a choice to participate in moderate exercise such as a daily walk is one of the most amazing things you can do for yourself to live a healthy lifestyle. 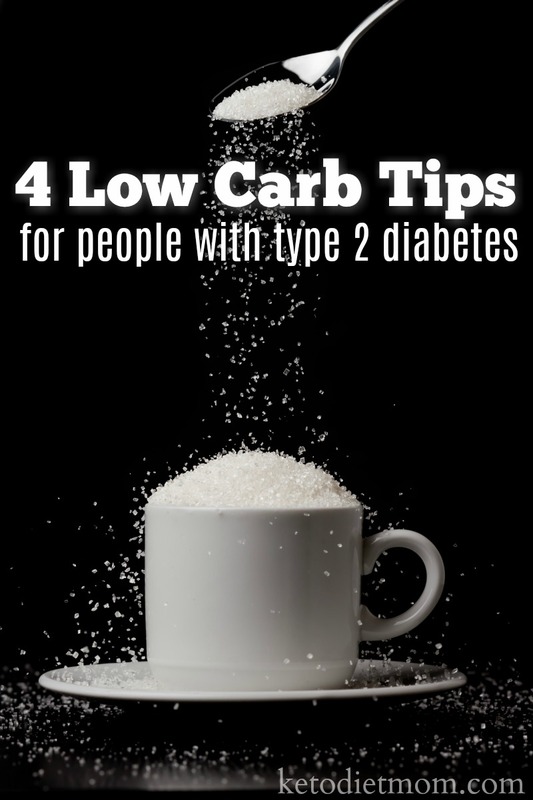 What other tips do you have for diabetics on a low carb diet?